As fertility is restored after renal transplant, more female recipients of a renal transplant successfully complete pregnancies that are safe for the mother, the fetus, and the renal allograft. Although the transplanted kidney lies in one of the iliac fossae, normal vaginal delivery is not impeded by this positioning. Caesarean section is indicated in many scenarios, primarily for obstetric reasons, particularly when the transplanted kidney lies in a position where it could be injured. Here, we report our experiences managing a rare instance of injury to a transplanted kidney during caesarean section and discuss the relevant aspects of its management. To our knowledge, this is the first report in the English literature of an injury to a transplanted kidney during caesarean section. Although there are reports of renal transplant recipients with graft dysfunction, rejection, and graft loss that may be related to pregnancy events, pregnancy following renal transplant is safe for the mother, fetus, and allograft if standard practice guidelines are strictly followed and high-risk factors are considered [1-3]. Caesarean section, both on an elective and an emergency basis, is often required for the safety of the mother and child [4, 5]. Injury to the transplanted kidney during caesarean section is a rare event that can adversely affect the survival of the fetus, the mother, and the allograft. Here, we report our experiences managing a rare instance of injury to a transplanted kidney during caesarean section and discuss the relevant aspects of its management. To our knowledge, this is the first report in the English literature of an injury to a transplanted kidney during caesarean section. A 35-year-old female recipient of a living-donor kidney conceived 5 years after transplant. Her renal functioning remained stable throughout the pregnancy, as demonstrated by a creatinine level of 130 µmol/L. Prior to the pregnancy, she had been normotensive with no antihypertensive therapy, and urinary protein excretion had been less than 100 mg per day. Maintenance immunosuppression consisted of microemulsion cyclosporine (150 mg bid) and azathioprine (50 mg qd). Owing to pre-eclampsia that developed at 34 weeks’ gestation (which manifested as hypertension, edema, and proteinuria), the infant was delivered at 35 weeks by semielective caesarean section while the patient received spinal anaesthesia. While gaining access to the gravid uterus through a Pfannenstiel incision, the lower pole of the transplanted kidney was accidentally transected, resulting in a 3 x 3 cm avulsion of the renal parenchyma, which was attached to the muscles of the anterior abdominal wall. Profuse bleeding from the kidney was controlled by direct pressure with gauze swabs, and the baby was delivered promptly through a lower segment cesarean section. The transplant surgeon on call was summoned to attend the case. When the swabs were removed from the kidney, there were bleeding arteries at the site of injury, which were sutured individually with interrupted horizontal mattress sutures using 2-0 Vicryl (Figures 1A and B). There was no evidence of urine leakage. The oozing raw surface was covered with Surgicel, and direct pressure was applied for approximately 5 minutes, which led to complete hemostasis. The defect was further covered by approximating the adjacent fringes of the peritoneum with 2-0 Vicryl sutures over the Surgicel (Figure 1C). An Exudrain (FG14) was left in the pelvis for 48 hours, and the bladder was kept empty for 5 days with a urethral catheter. Amoxicillin (500 mg tid) and clavulanic acid (125 mg tid) were administered for 5 days as prophylaxis against infection. Four units of blood were transfused because the hemoglobin had dropped to 64 g/L from a preoperative level of 110 g/L. Postoperatively, there was no macroscopic hematuria or urine leak, and the patient’s recovery was uneventful. The serum creatinine level rose to 180 µmol/L for first 2 days following the lower segment cesarean section and stabilized at 140 µmol/L thereafter. 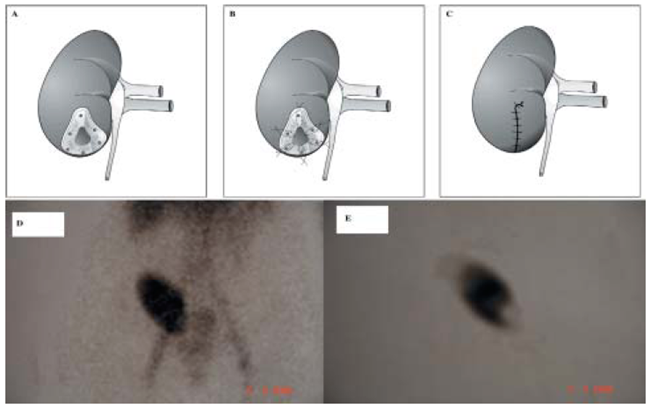 A MAG3 renogram showed normal perfusion of the kidney (Figure 1D); however, a dimercaptosuccinic acid scan revealed a filling defect at the lower pole corresponding to the site of injury (Figure 1E). Pregnancy following renal transplant is associated with hypertension, pre-eclampsia, or both in approximately 30% of the cases . Despite the pelvic location of the transplanted kidney, the transplanted kidney rarely produces dystocia, and generally there is no mechanical injury to the transplanted kidney during vaginal delivery [7, 8]. Thus, caesarean section is performed mainly for obstetric reasons. The reported incidence of caesarean section in pregnancy following renal transplant is as high as 64%, reflecting the high degree of clinical caution exercised in these patients [9, 10]. Because the transplanted kidney (which is placed in one of the iliac fossae extraperitoneally) lies close to the lower uterine segment of the gravid uterus, injury to the transplanted kidney during lower segment cesarean section is a rare complication. The muscles of the anterior abdominal wall overlying the transplanted kidney can adhere to the anterior surface of the kidney, as was the case in our patient, and this predisposes the kidney to injury while opening the abdomen or the uterus. This can be prevented by paying attention to the anatomic structures and through meticulous dissection. Early discussions between the obstetrician and the transplant surgical team, on a case-by-case basis, are helpful in planning the surgical approach. In the event of an injury to the kidney, temporary hemostasis can be maintained by packing the bleeding site with gauze swabs while awaiting help. Sufficient blood for transfusion should be readily available, as significant blood loss can occur in a short period in hypertensive patients, posing a threat to the fetus, the mother, and the transplanted kidney. Proper visualization of the bleeding vessels is required prior to suturing them, and this is accomplished through suction and application of digital pressure. It is important to suture individual bleeding vessels with absorbable sutures incorporating a minimal amount of renal parenchyma. If the calyces are injured, they should be repaired with similar sutures. Continuous oozing from the renal parenchyma should be controlled with topical hemostatic agents such as Surgicel, and the free edges of the peritoneum should be approximated to cover the raw surface. Following the repair, there are potential risks of secondary hemorrhage, cortical abscess formation, and urine leak, and appropriate monitoring should be undertaken with clinical, hematologic, biochemical, and radiologic investigations. Keeping the bladder decompressed with a urethral catheter is important to reduce back pressure on the kidney and to prevent urine leak, as reflux of urine into the transplanted kidney is common. A surgical approach to the uterus during caesarean section through a midline incision, both on the abdominal wall and the uterus, as in a classic caesarean section, may be more appropriate in renal transplant recipients, particularly in patients with transplanted kidneys in both iliac fossae. Awareness of a possible injury of this nature while performing lower segment cesarean section in a renal transplant recipient is paramount, and a multidisciplinary approach should be adopted to avoid this complication, as it can pose significant risk to the survival of the transplanted kidney, the fetus, and the mother. Figure 1. (A) Operative finding. (B) Sutured bleeding vessels. (C) Peritoneum sutured over the defect. (D) MAG3 renogram. (E) Dimercaptosuccinic acid scan.